"True creative excess." Well Go USA recently released another new trailer for the action film Three, from Hong Kong director Johnnie To. We already featured a trailer for this film last year when it was about to hit theaters, but this new trailer is awesome and worth checking out. Johnnie To's latest film is an action-thriller set almost entirely inside of a hospital where the lives of three people intersect. When a police sting goes bad, a master criminal makes a desperate choice: he forces the cops to shoot him. Once in the hospital, he refuses treatment, instead waiting for his cohorts to break him out. The tension builds between the cop and a surgeon assigned to save his life. The cast features Louis Koo, Wallace Chung, and Vicki Zhao. Realizing that he will be defeated in no time during a police showdown, a thug shoots himself to force the cops to cease fire and take him to the hospital. In the hospital, he claims human rights to refuse immediate treatment in order to bide time for his underlings to rescue him. The detective in charge sees through his scheme but decides to play along so as to capture his whole gang once and for all. 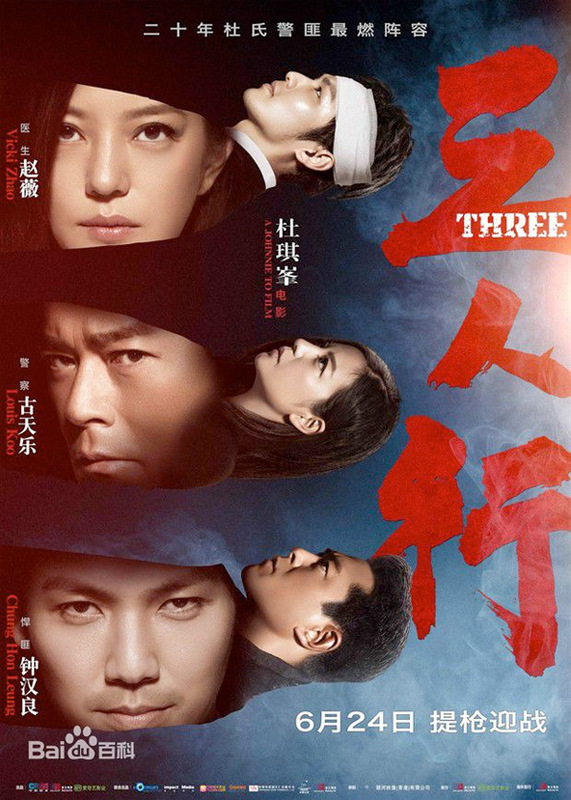 Three is written & directed by veteran Hong Kong filmmaker Johnnie To, who has made many films including most recently Mad Detective, Vengeance, Romancing in Thin Air, Drug War, Blind Detective and Don't Go Breaking My Heart 1 & 2. Well Go first released To's Three in select US theaters starting June 24th last year. Anyone? Damn! Those gunshot pops are something new and different! !